Joanne Sher: Editor/Proofreader : Perfect Picture Book Friday: Guess Again! Perfect Picture Book Friday: Guess Again! It's been a while, eh? :)Well, it appears I might be SLOWLY working my way back into blogging. I found a blog hop/meme that I think will be QUITE fun, and decided to jump in this week. I guarantee it won't be an every week thing - but I'll certainly share on occasion. Just for your own info - Perfect Picture Book Friday is a feature on children's author Susanna Leonard Hill's blog where people share information on favorite picture books on their own blogs, then link their post in the gadget on her post. She keeps an entire list of all the ones featured for anyone's reference (check it out here!). Now that I am reading a picture book a day for research, I figure this will be a good place to share my gems. And I have to tell you, my first one is JUST that! Synopsis: Trust me - the answer is NOT what you think! This is a book that will kep you guessing again and again and again (and laughing!). The author sets up what seem to be "easy" rhymes - but then each one is absolutely NOT what you would expect. The illustrations add to the fun. Resources: Personally, I think this would be an AWESOME mentor text for kids learning about poetry - and probably surprises/twists in writing as well. Inference as well. :) Studying the rhyme and meter and such could help them learn, in a fun way, what makes a poem a poem. Why I love it: It is, in a word, hysterical. The poetry is so masterfully done that the surprise at the end of each stanza is completely, well, surprising. The art is super clever - and it is fun (for adults AND kids) to figure out how they were "fooled." I shared this book with my kids (ages 10 and 13) - they loved it. With my husband, my hairdresser, and just about anyone who would listen - and each one was delighted. So extremely, extremely clever. So, hope you'll give this one a look - and check out OTHER perfect picture books at Susanna Leonard Hill's place. This duo continues to amaze me with their creative twists on the pb form. My library doesn't carry this one. It looks like an inter-library loan is in order. Thanks. Oh - they've done MORE?? I absolutely have to get my hands on others by them. Guess I need to check my library! Thanks for stopping by, AND thanks for the tip!! What a unique and entertaining book that both kids and adults will enjoy. And, it is wonderful that the poetry is done so well. Thanks for sharing! You're very welcome, Patricia - hope you pick it up - and laugh! Thanks for stopping by! Mr Barnett and Mr Rex make an awesome duo!! I'll have to look for this book. It looks hilarious! Thanks! There is no end to the talent of Rex and Barnett, but I haven't seen this one yet! Thanks for the recommendation! Hope you enjoy it as much as I have, Cathy! Oops - I missed this one! Glad you picked it! Thanks, Julie! Appreciate you stopping by! Like the others, this is one my library doesn't have. Why is this?! It sounds awesome and I want it. Thanks for pointing it out, Joanne. My pleasure, Wendy - hope you can find it!! :) Thanks for stopping by! I can't believe I haven't read this one, Joanne! It sounds delightful! 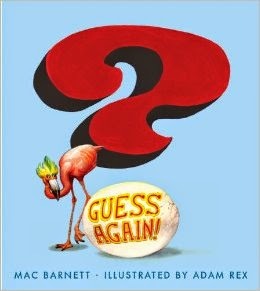 And any collaboration between Mac Barnett and Adam Rex is a must-read! Of course, now I'm dying to know what the answer was that wasn't "bunny" :) Thank so much for adding this fun book to our list! this book looks like too much fun! I've never seen it... must find it now!